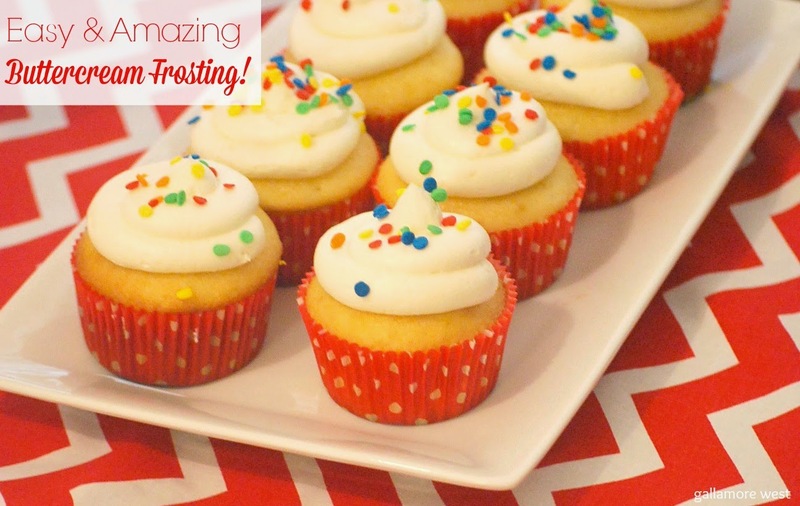 Looking for an amazing and easy buttercream frosting recipe? This one is perfect- I get asked for this recipe ALL the time! It's creamy, sweet, and looks awesome when piped onto cupcakes. Also, it's super easy to make so you can wow your friends and family with this one at your next party. Cream butter on high in stand mixer until light and fluffy, about 2-3 minutes. SLOWLY add in the powdered sugar, about one cup at a time, until mixed. Stop to scrape down sides of bowl often. Add in the vanilla. SLOWLY add in one tablespoon of milk at a time until your frosting reaches desired consistency. Let it mix in high for 3-4 minutes until your frosting is light and whipped looking. I use Wilton plastic disposable piping bags and a Wilton 1A tip to pipe my frosting onto my cupcakes. Sweet, simple, and always a hit at our parties... enjoy! !